* Senior club appearances and goals counted for the domestic league only and correct as of 22:32, 20 May 2016 (UTC). Robert Lester "Bobby" Zamora (born 16 January 1981) is an English professional footballer who plays as a striker. Zamora began his career at Football League club Bristol Rovers, but was soon signed by Brighton & Hove Albion, where he found first team success. Zamora scored 77 goals in three seasons and helped the club achieve two successive promotions. Following a spell at Tottenham Hotspur, Zamora was signed by West Ham United, where he played for five years and won promotion to the Premier League. Zamora joined Fulham in 2008, where, in his first season, he played regularly but scored only four goals. However, Zamora's form in the 2009–10 season gained praise and subsequently saw the player gain a call-up for England. Zamora had an important role in Fulham's successes in the Premier League, FA Cup and UEFA Europa League, before transferring to Queens Park Rangers in January 2012. Zamora also played for the England national under-21 team before gaining his first full cap at senior level almost a decade later. Born in Barking, London, Zamora attended Essex Junior School (in Manor Park) followed by Little Ilford School before moving onto Barking Abbey Secondary School. As a boy, he played for Senrab in east London, alongside John Terry, Ledley King, Paul Konchesky and Jlloyd Samuel. A lifelong West Ham United fan, he started his footballing career as an apprentice at the club's "Academy of Football" but was released from the East London club on the same year group as Samuel, Fitz Hall and Konchesky. Zamora joined Bristol Rovers as a trainee in August 1999, making a total of six substitute appearances for Bristol Rovers in all competitions, before joining Bath City on a one-month loan in early 2000, where he scored eleven goals in eight games, and then Brighton & Hove Albion on loan in February 2000. Zamora joined Brighton in February 2000 on a three-month loan until the end of the 1999–2000 season, scoring six goals in six games. In August 2000, he made a permanent move to Brighton for a £100,000 fee. During his tenure he quickly established himself as a prolific goalscorer, breaking into the England national under-21 team and attracting interest from several higher-division clubs. He scored 83 times for the club in 136 appearances, helping Brighton win two successive championships as the team won promotion into what became the Championship. The Brighton fans had a chant they used to sing in his honour, to the tune of Dean Martin's That's Amore: "When the ball hits the goal it's not Shearer or Cole, it's Zamora." Having been watched for much of the previous two seasons by the then manager Glenn Hoddle, Zamora moved to Tottenham Hotspur for a £1.5 million fee in July 2003. However, he struggled to gain a consistent first-team place at White Hart Lane, making only 18 cup and league appearances, eleven as substitute, and scoring a single goal, knocking West Ham United out of the League Cup in October 2003. In January 2004, Zamora joined West Ham in a deal which saw Jermain Defoe go the other way to Tottenham Hotspur. He quickly made his mark, scoring on his debut as West Ham came from behind to beat Bradford City and also on his home debut, when he scored the winning goal against Cardiff City. In the 2004–05 season, Zamora scored 13 goals, including one in the first leg and two in the second leg of the Championship play-off semi-final against Ipswich Town and the only goal in West Ham's 1–0 victory over Preston North End in the Championship play-off final sending West Ham into the Premier League. In the 2005–06 season, he made 42 league and cup appearances and scored ten goals as West Ham finished in the top half of the Premier League and reached the FA Cup final, for which he received an FA Cup runners-up medal, missing a penalty in the shootout against Liverpool. He was rewarded for his contribution to the team with a new four-year contract in January 2006, and extended it to 2011 in October 2006, saying, "I'm delighted to have extended my contract and I'm now looking forward to spending my long-term future at Upton Park. I've been here for almost three years now, and there is really no other place I would rather be. This is my club and wearing a claret and blue shirt is all I have ever wanted to do." He started the 2006–07 season well, scoring five of the Hammers' six goals in the first four games of the season but, as West Ham hit a bad patch that saw them struggling in the relegation places, he did not score again until January 2007. However, he ended the season with eleven goals, including a controversial goal against Blackburn Rovers in March 2007 and being the first player to score a winning goal against Arsenal at the Emirates Stadium in April 2007, as West Ham pulled off an unexpected escape from relegation. He made only 14 appearances for West Ham in the 2007–08 season after missing five months of the season with tendinitis suffered in August 2007 but scored against Derby in the Hammers' 2–1 win. By the end of the 2007–08 season, Zamora had made 152 appearances in all competitions for West Ham, scoring 40 goals. In July 2008, Zamora and teammate John Paintsil were signed by Fulham for a joint £6.3 million fee, Zamora being £4.8 million of the total fee. In his first season for Fulham, Zamora struggled to find the net, scoring just twice in 35 league appearances over the 2008–09 season, despite generally playing well and playing a fairly important part in the team's success in his debut season. After the season had finished, Fulham and Hull City agreed a fee on 15 July, which would have seen Zamora move to Hull for £5 million. However, he decided to stay with Fulham in order to attempt to prove his critics wrong. Shortly after he turned down Hull, he played in a friendly against Peterborough United and scored two goals. Then four days later he made his UEFA Europa League debut and scored once and set up two goals to give Fulham a 3–0 away advantage going into the next leg. He opened his 2009–10 Premier League account on the opening day of the season when a Clint Dempsey shot hit him on the back and beat David James in the Portsmouth goal. He scored his second goal of the season against Hull on 19 October 2009 by heading in a rebound in the 43rd minute. Fulham won the game 2–0. Scoring the lone goal against Sunderland, Zamora doubled his output from the previous season with his fourth goal of the campaign. In Fulham's UEFA Europa League match against Basel, Zamora scored twice in their 3–2 victory in St. Jakob-Park. On 19 December 2009, Zamora scored once again against Manchester United in their 3–0 win at Craven Cottage. On 5 January 2010, he dislocated his shoulder at the Britannia Stadium in Fulham's 3–2 loss to Stoke City. Zamora struck the winner in Fulham's UEFA Europa League Round of 32 first leg against Shakhtar Donetsk, a match that finished 2–1. The strike was a powerful strike from outside the box that went in off the underside of the crossbar. Zamora then continued his scoring form when he scored a last minute free kick against Birmingham City to win the game 2–1. Zamora also scored Fulham's first goal in what was an historic UEFA Europa League comeback against Juventus, Fulham went on to win the game 4–1. Zamora was widely praised for the trouble he caused Juventus' veteran captain Fabio Cannavaro, prior to Cannavaro's sending off. He continued to impress on the European stage for Fulham; scoring in both legs in a 3–1 aggregate win against the German Champions Wolfsburg as Fulham progressed to the UEFA Europa League semi-final. They reached the final but were beaten 2–1 by Atlético Madrid of Spain. On 10 September 2010, Zamora signed a new four-year contract with Fulham, which would have kept him at the London club until the summer of 2014. The day after, Zamora broke his leg during a match against Wolverhampton Wanderers. Zamora made his return from injury as a substitute in the FA-Cup encounter against Bolton Wanderers on 21 February 2011. He marked his Premier League return, again as a substitute, with a match-deciding goal from the penalty spot against Blackburn Rovers on 5 March 2011. On 31 January 2012, Zamora joined Fulham's West London Premier League rivals Queens Park Rangers on a two-and-a-half-year contract for a fee believed to be around £4 million. He scored on his debut on 4 February in a 2–1 defeat to Wolverhampton Wanderers. On 21 November 2012, it was announced Zamora would be out injured for three months due to requiring surgery on a hip injury. Zamora was a member of the Queens Park Rangers side which won the 2014 Football League Championship play-off Final 1–0 against Derby County on 24 May 2014 at Wembley Stadium. He scored the only goal of the game in the 90th minute to return QPR to the Premier League after a one-season absence. In May 2015, Queens Park Rangers announced the release of Zamora. On 3 August 2015, Zamora joined former club Brighton on a one-year deal on a free transfer. He claimed that he turned down an approach by a team competing in the UEFA Champions League to return to Brighton. His first goal on return to Brighton was an 89th-minute winner against Leeds United on 17 October 2015, coming 4,549 days after his last goal for the club in a 2–2 draw at Grimsby on 4 May 2003. Zamora was released by Brighton when his contract expired at the end of 2015–16. Zamora was called up for the England Under-21 squad for a friendly with Portugal in April 2002. Zamora was named in the England Under-21 squad for the 2002 UEFA European Under-21 Championship with David Platt, the then England Under-21 team manager, saying of him, "My mistake was not going to have a look at him earlier than I did. He's been in one squad, did very well in training and came on for 25 minutes and did great. If I need a goal and look at my bench and see a player who has scored 30 for the past two seasons, there is a chance he could come on. He warrants his place. [...]" Zamora was capped six times for the England Under-21 team. Zamora was watched by the Trinidad and Tobago coach, Leo Beenhakker, who also spoke to his club manager at the time Alan Pardew. However, Zamora turned down the chance of playing in the 2006 FIFA World Cup with Trinidad and Tobago, saying in August 2005, "Trinidad is my dad's country and to play in the finals would be a dream but West Ham are more important. I am only thinking about the club at the moment and do not want to be distracted from that." On 7 August 2009, it was revealed that Zamora and Jlloyd Samuel had received their Trinidadian passports, and would play for the Soca Warriors in their 2010 FIFA World Cup qualifier against El Salvador on 12 August. However, Zamora did not get his first cap due to an injury he picked up while training. 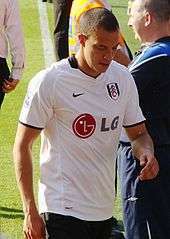 His form in the 2009–10 season led to calls for Zamora to be called up to the England squad, and there had been rumours that Fabio Capello had been visiting Craven Cottage to look at his performances. However, due to an Achilles injury, he was not included in Fabio Capello's provisional squad of 30 players for the run-up to the 2010 FIFA World Cup, which was announced on 11 May 2010. On 7 August 2010, Zamora was one of five uncapped players named in the England squad for their friendly on 11 August against Hungary alongside Jack Wilshere, Kieran Gibbs, Michael Dawson and Gary Cahill. On 11 August 2010, Zamora won his first England cap in a friendly, coming on as a half time substitute against Hungary in a 2–1 win at Wembley Stadium. On 23 May 2011, Zamora was selected for the England squad to face Switzerland in the UEFA Euro 2012 qualifier on 4 June at Wembley Stadium. On 15 November 2011, Zamora made his full England debut by starting in the 1–0 friendly victory over Sweden at Wembley Stadium. Zamora has been sponsored by Under Armour, the US sportswear company, since 2006. He wears Under Armour's Dominate Boots. 1 2 3 4 5 6 Hugman, Barry J., ed. (2010). The PFA Footballers' Who's Who 2010–11. Edinburgh: Mainstream Publishing. p. 450. ISBN 978-1-84596-601-0. ↑ "Lessons from Senrab's soccer school". BBC Sport. 30 March 2004. Retrieved 30 June 2007. ↑ "Zamora: I want to pick myself". The Football Association. 5 June 2003. Retrieved 1 January 2014. ↑ "The Interview: Bobby Zamora meets Just Football". Just Football. 3 June 2009. Retrieved 17 November 2009. ↑ Pilger, Sam (October 2003) "The Boy's A Bit Special". FourFourTwo. Issue 110. p. 31. 1 2 3 4 5 6 7 "Bobby Zamora". Soccerbase. Racing Post. Retrieved 20 June 2007. 1 2 "Zamora signs in at Spurs". The Football Association. 18 July 2003. Retrieved 1 January 2014. ↑ "Seagulls swoop for Zamora". BBC Sport. 10 August 2000. Retrieved 30 June 2007. 1 2 "Zamora handed Under-21 chance". BBC Sport. 13 April 2002. Retrieved 30 June 2007. ↑ "Brighton reject record Zamora bid". BBC Sport. 19 February 2001. Retrieved 30 June 2007. ↑ "Everton cool on Zamora". BBC Sport. 16 January 2002. Retrieved 30 June 2007. ↑ "Brighton 0–0 Swindon". BBC Sport. 13 April 2002. Retrieved 30 June 2007. ↑ "Zamora ready for the big time". BBC Sport. 18 April 2003. Retrieved 30 June 2007. ↑ Jacob, Gary; Kay, Oliver (18 June 2003). "Hoddle goes for youth with £2m Zamora". The Times. London. Retrieved 15 August 2007. ↑ "Tottenham 1–0 West Ham". BBC Sport. 29 October 2003. Retrieved 6 July 2007. ↑ "Spurs sign Defoe". BBC Sport. 2 February 2004. Retrieved 20 June 2007. ↑ "Bradford 1–2 West Ham". BBC Sport. 6 February 2004. Retrieved 6 July 2007. ↑ "West Ham 1–0 Cardiff". BBC Sport. 28 February 2004. Retrieved 6 July 2007. ↑ "West Ham 2–2 Ipswich". BBC Sport. 14 May 2005. Retrieved 6 July 2007. ↑ "Ipswich 0–2 West Ham". BBC Sport. 18 May 2005. Retrieved 6 July 2007. ↑ "Zamora puts Hammers back into Premiership". BBC Sport. 30 May 2005. Retrieved 5 July 2007. ↑ "Liverpool 3–3 West Ham (aet)". BBC Sport. 13 May 2006. Retrieved 9 July 2007. ↑ "Zamora pens new Hammers contract". BBC Sport. 18 January 2006. Retrieved 10 July 2007. ↑ "Zamora signs new Hammers contract". BBC Sport. 7 October 2006. Retrieved 10 July 2007. 1 2 3 4 "Games played by Bobby Zamora in 2006/2007". Soccerbase. Centurycomm. Retrieved 18 April 2016. ↑ Sinnott, John (17 March 2007). "Blackburn 1–2 West Ham". BBC Sport. Retrieved 21 July 2008. ↑ Cheese, Caroline (7 April 2007). "Arsenal 0–1 West Ham". BBC Sport. Retrieved 10 July 2007. ↑ "Magnusson hails West Ham survival". BBC Sport. 7 April 2007. Retrieved 10 July 2007. 1 2 "Games played by Bobby Zamora in 2007/2008". Soccerbase. Centurycomm. Retrieved 18 April 2016. ↑ "Curbs not selling Zamora". Sky Sports. 8 December 2007. Retrieved 1 January 2014. ↑ "Zamora & Paintsil sign for Fulham". 15 July 2008. BBC Sport. Retrieved 15 July 2008. ↑ "Brown still keen to sign Zamora". BBC Sport. 27 July 2009. ↑ Jackson, Jamie (19 October 2009). "Diomansy Kamara's clincher is another negative for Hull". The Guardian. London. Retrieved 1 January 2014. ↑ "Fulham striker Bobby Zamora suffers collarbone injury". BBC Sport. 7 January 2010. Retrieved 7 January 2010. ↑ Lewis, Darren (12 May 2010). "Fulham end of season report 2009-10". Daily Mirror. London. Retrieved 1 January 2014. ↑ Dawkes, Phil (1 May 2010). "Fulham 2–1 Wolfsburg". BBC Sport. Retrieved 8 May 2010. ↑ Dawkes, Phil (8 May 2010). "Wolfsburg 0–1 Fulham (agg 1–3)". BBC Sport. Retrieved 8 May 2010. ↑ "Zamora's New Deal". Fulham F.C. Retrieved 1 January 2014. ↑ "Hughes' Wolves Reaction". Fulham F.C. Retrieved 1 January 2014. ↑ "Bobby's Boost". Fulham F.C. Retrieved 1 January 2014. ↑ "Match Winner". Fulham F.C. Retrieved 1 January 2014. ↑ "QPR complete the signing of striker Bobby Zamora from Fulham". BBC Sport. 31 January 2012. Retrieved 19 April 2016. ↑ "QPR 1–2 Wolves". BBC Sport. 4 February 2012. Retrieved 5 February 2012. ↑ "Bobby Zamora to miss three months for QPR after hip surgery". BBC Sport. 21 November 2012. ↑ "Derby County 0–1 Queens Park Rangers". BBC Sport. 24 May 2014. Retrieved 25 May 2014. ↑ Jacob, Gary (24 May 2014). "Bobby Zamora strikes late as ten-man QPR return to the Premier League". The Times. London. Retrieved 25 May 2014. ↑ "Rio Ferdinand and Joey Barton among six to leave QPR". BBC Sport. Retrieved 27 May 2015. ↑ Camillin, Paul (3 August 2015). "Brighton & Hove Albion have tonight completed the signing of striker Bobby Zamora on a one-year contract". Brighton & Hove Albion F.C. Retrieved 3 August 2015. ↑ "Bobby Zamora 'chose Brighton over Champions League club'". BBC Sport. 4 August 2015. Retrieved 4 August 2015. ↑ "Brighton: Gordon Greer and Bobby Zamora among five released by Championship club". BBC Sport. 20 May 2016. Retrieved 20 May 2016. ↑ "Platt hails Zamora". BBC Sport. 9 May 2002. Retrieved 30 June 2007. ↑ "England Bobby Zamora". The Football Association. Retrieved 20 October 2010. ↑ "Zamora turns down Trinidad call". BBC Sport. 21 August 2005. Retrieved 10 July 2007. ↑ "Zamora and Samuel get Trinidad passports". ttgapers.com. 8 August 2009. Archived from the original on 2 January 2014. Retrieved 1 January 2014. ↑ "Zamora, Samuel out El Salvador clash". Trinidad and Tobago Guardian. Port of Spain. Retrieved 1 January 2014. ↑ "Zamora reveals England agony". The Independent. London. 13 May 2010. Retrieved 1 January 2014. ↑ "Capello calls up Wilshere, Gibbs and Zamora for England". BBC Sport. 7 August 2010. Retrieved 7 August 2010. ↑ "Gerrard brace saves England blushes". ESPN FC. 11 August 2010. Retrieved 1 January 2014. ↑ "Fulham's Zamora and Stockdale named in England squad". BBC Sport. 23 May 2011. Retrieved 24 May 2010. ↑ "Bobby Zamora's display for England against Sweden enough to lay claim for place at Euro 2012". The Daily Telegraph. London. 16 November 2011. Retrieved 4 March 2012. ↑ "Under Armour launches football boot range". Sports Insight Magazine. 16 June 2009. Retrieved 10 July 2009. 1 2 "Games played by Bobby Zamora in 1999/2000". Soccerbase. Centurycomm. Retrieved 18 April 2016. ↑ "Games played by Bobby Zamora in 2000/2001". Soccerbase. Centurycomm. Retrieved 18 April 2016. ↑ "Games played by Bobby Zamora in 2001/2002". Soccerbase. Centurycomm. Retrieved 18 April 2016. ↑ "Games played by Bobby Zamora in 2002/2003". Soccerbase. Centurycomm. Retrieved 18 April 2016. 1 2 "Games played by Bobby Zamora in 2003/2004". Soccerbase. Centurycomm. Retrieved 18 April 2016. 1 2 "Games played by Bobby Zamora in 2004/2005". Soccerbase. Centurycomm. Retrieved 18 April 2016. ↑ "Games played by Bobby Zamora in 2005/2006". Soccerbase. Centurycomm. Retrieved 18 April 2016. ↑ "Games played by Bobby Zamora in 2008/2009". Soccerbase. Centurycomm. Retrieved 18 April 2016. ↑ "Games played by Bobby Zamora in 2009/2010". Soccerbase. Centurycomm. Retrieved 18 April 2016. ↑ "Games played by Bobby Zamora in 2010/2011". Soccerbase. Centurycomm. Retrieved 18 April 2016. 1 2 "Games played by Bobby Zamora in 2011/2012". Soccerbase. Centurycomm. Retrieved 18 April 2016. ↑ "Games played by Bobby Zamora in 2012/2013". Soccerbase. Centurycomm. Retrieved 18 April 2016. 1 2 "Games played by Bobby Zamora in 2013/2014". Soccerbase. Centurycomm. Retrieved 18 April 2016. ↑ "Games played by Bobby Zamora in 2014/2015". Soccerbase. Centurycomm. Retrieved 18 April 2016. ↑ "Games played by Bobby Zamora in 2015/2016". Soccerbase. Centurycomm. Retrieved 20 May 2016. ↑ "Zamora, Bobby". National Football Teams. Retrieved 18 April 2016. Wikimedia Commons has media related to Bobby Zamora.